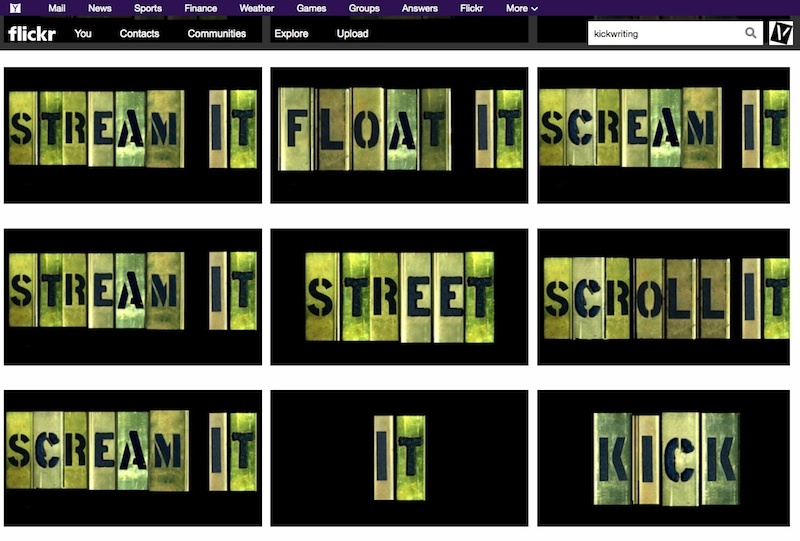 A screenshot from Flickr of a search for “kickwriting,” the results of which feature John Fekner’s photographs of stencils arranged with little discernible pattern to form a poem. In September 2010, Fekner uploaded five photos of brass stencil templates that combined to spell out “MY AD IS NO AD,” a phrase from one of Fekner’s most popular street pieces. It was the first in a series of “cloud poetry” pieces that Fekner would upload to Flickr, poems made to live in the ether of the internet. The photos were tagged with words like “kickwriting” (a word coined by Jack Kerouac) and “vienna” (because the project was initially for the BLK River Festival in Vienna). The hope was that people search Flickr or Google Images for “kickwriting” or “Vienna” could come across Fekner’s work, similar to how Saber pollutes hashtags on Twitter. The method has succeeded somewhat, with Fekner’s cloud poems coming up at the top of searches for “kickwriting” on Flickr and on Google Images. But the words don’t come up in the expected order. You can’t read, “MY AD IS NO AD” right out of the search results. Instead, you get something like “IS THE KEY THIS WITHIN SWEAT WORK,” where multiple cloud poem phrases have been combined and rearranged by search engine algorithms to form something new, a hybrid of Dada and Concrete Poetry for the digital age. With over 200 words and individual letters uploaded so far, the possibilities for different poems are immense. Which actually relates to another cloud poem that Fekner uploaded, “THE END OF READING IN A STRAIGHT LINE,” a phrase that he and his collaborator Don Leicht have been using for years. Unlike a lot of viral art (particularly organic viral art), cloud poetry has a long shelf life and doesn’t have to “go viral” in the sense of getting millions of views overnight. The images can exist online indefinitely, with different combinations arising for different viewers over years or possibly even decades. With cloud poetry, Fekner is making a form of invasive viral art that is polluting search results, but he is also exploring the architecture of the web in a way that might fascinate more traditional internet artists.